We love this EASY homemade BBQ Chex Mix Recipe – it’s an easy Chex mix made in the crockpot flavored with homemade BBQ seasoning! Are you a sweet or salty person? They say that people usually favor one or the other; I’m clearly a sweet! Sometimes though I get a salty hankering and I just want something salty and crunchy, like chips or snack mix. These cravings usually make me reach for one of two things: BBQ chips or Chex Mix. Last time I had the craving I thought…why not make BOTH? I think I love BBQ seasoning so much because it’s salty and sweet at the same time. I’m borderline obsessed with making my own homemade BBQ seasoning because I can sprinkle it on everything: chips, popcorn, baked potatoes…the options are endless. 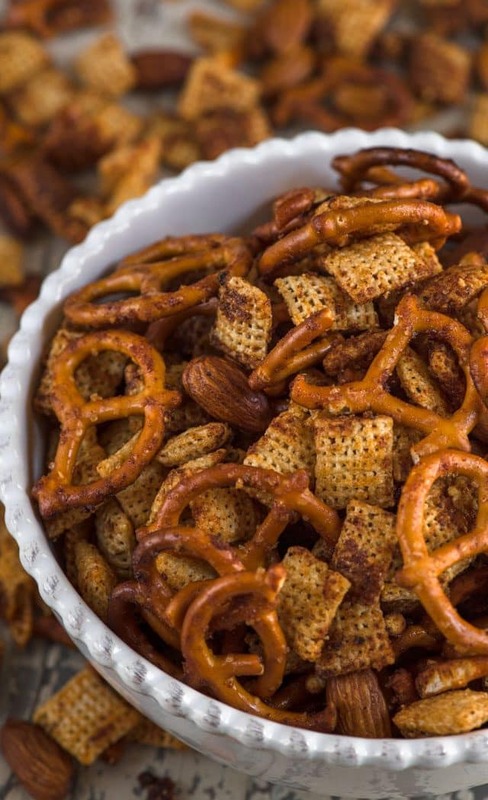 When I decided to make my own Chex mix, I knew I wanted to make it in the slow cooker. This makes it easy and you don’t have to babysit it like you would if it was in the oven. I’ve been slightly obsessed with crockpot recipes this year…so beware. 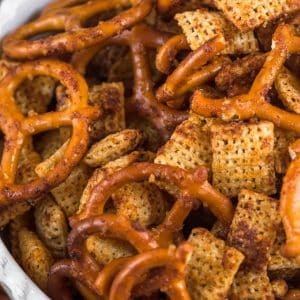 Adding homemade BBQ seasoning to homemade Chex mix makes this the perfect easy snack mix, all made in the slow cooker! Let’s break down the components of this recipe, namely the homemade BBQ seasoning. Ever wondered how to make BBQ seasoning mix? Learn how now! Smoked paprika gives it that smokey flavor, along with smoked chili powder. Using the regular versions won’t make them taste like BBQ chips, so be sure and get smoked. Round out the BBQ flavor with onion and garlic powder, salt, and pepper. Mixed together, this simple BBQ seasoning mix can be stored in a jar in the pantry and sprinkled on everything from vegetables to potatoes to popcorn. 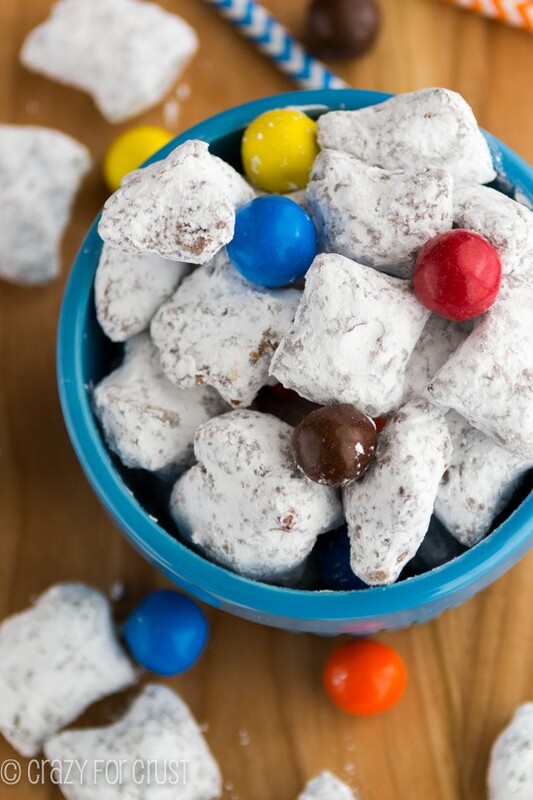 Or…turn it into slow cooker Chex mix! One thing I love about making Chex mix at home is I can add anything I want to it. 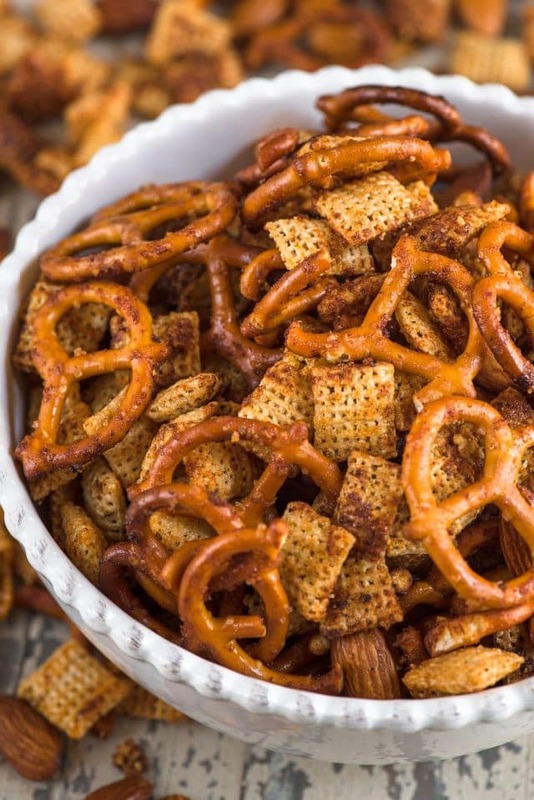 What’s your favorite part of regular Chex mix? Mine are the cereal pieces. I also love the pretzels…and pretty much everything in it. The one thing I always miss is nuts. Adding nuts to any snack mix adds crunch and flavor and, in the case of almonds, some protein. I highly recommend that you use a slow cooker liner. It makes it easier for clean-up and it’s less likely to burn. If you’re not using al liner, be sure to spray the insert with nonstick cooking spray. Rice Chex, but you could use any flavor. Simply mix them all in the crockpot and then prepare your topping. To get the BBQ seasoning mix to stick to the snack mix, I mixed it with butter. Stir up the mixture and pour it into your slow cooker. Cook on low, stirring every 20 minutes, for about an hour to an hour and half. Once you just start to smell it, it’s done. 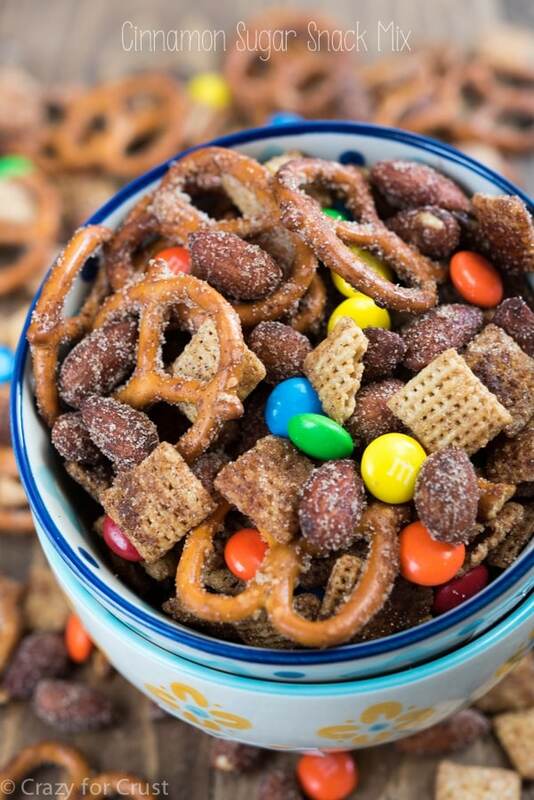 Snack mix like this BBQ Chex Mix is perfect for afternoon snacking or even game day! 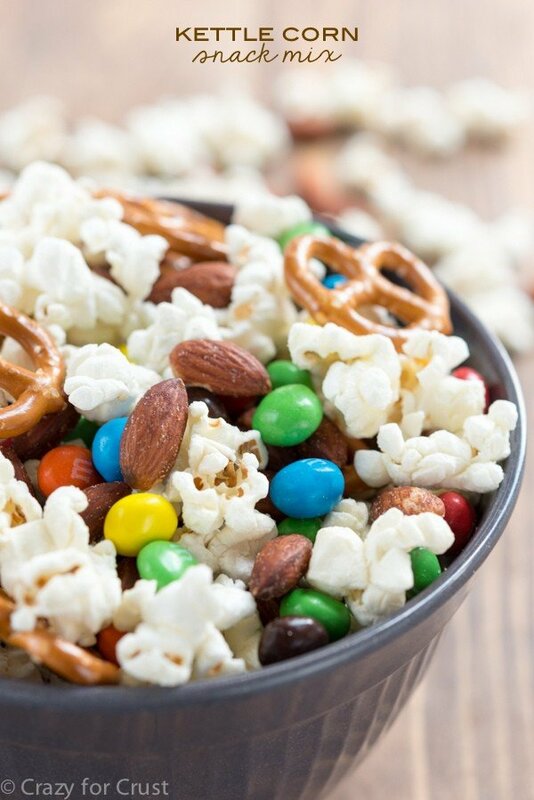 Use your favorite snack items, just use a total of about 8 cups. Be sure to stir this often. If the mixture sits in one spot too long it can burn. Turn the hot mix out onto a cookie sheet and let it cool, then store it in an airtight container. It’ll last up to a week but will be gone before that! 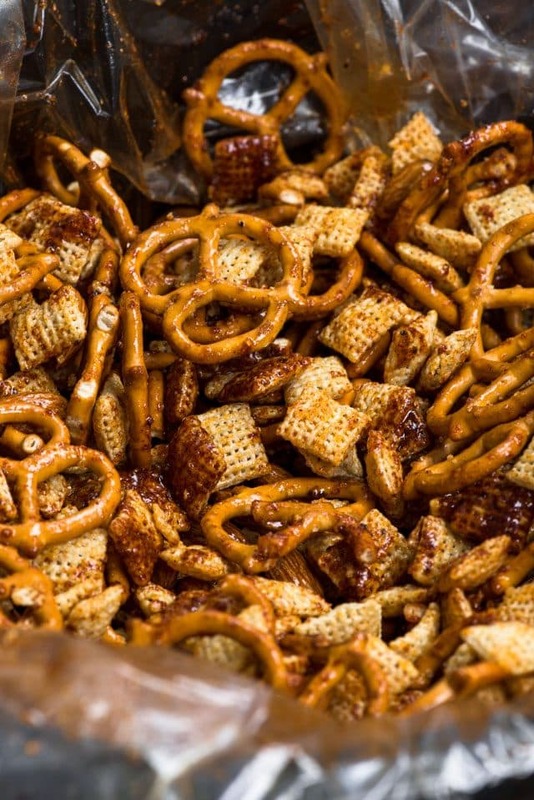 Make homemade Chex Mix with a BBQ flavoring! 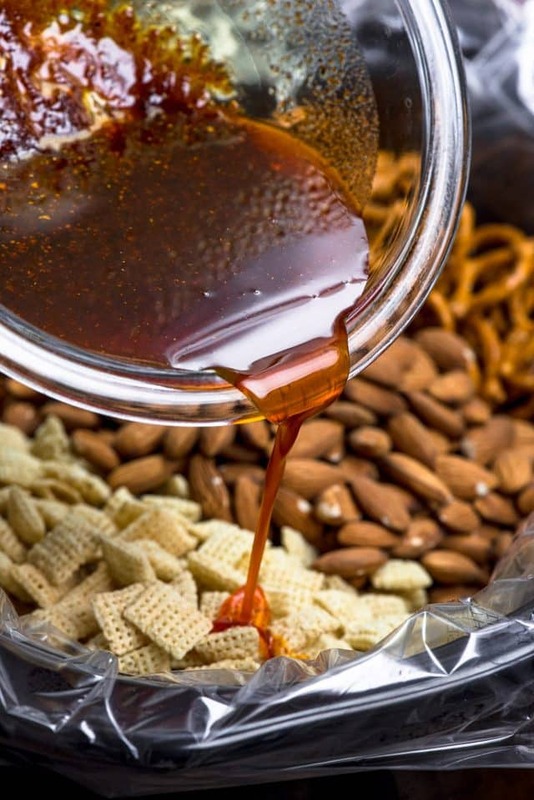 This easy BBQ Chex mix recipe is made in a slow cooker and is the perfect snack mix with almonds and pretzels. Stir together brown sugar, paprika, salt, garlic powder, chili powder, onion powder, and pepper. Stir in the melted butter. Place cereal, pretzels, and almonds in the bottom of a 5-7 quart slow cooker. Tip: use a slow cooker liner to help with easy clean-up. Pour butter mixture over the top and stir to coat. Cover and cook on low, stirring every 20 minutes, until mixture is hot and coated, about 1 to 1 1/2 hours. Be sure to stir it well. Turn hot mix out onto a cookie sheet and let cool. I’m always looking for more savory snack recipes and this looks delicious I just can’t find smoked chili powder what brand and where can I find it thank you.